On Sun 20th May I ventured across to Darren Woods in Llangynwyd,Maesteg which I can probably describe as my "local patch" in search of Wood Warbler and Pied Flycatcher. Pied Flycatcher have been thin on the ground there during the last couple of years but Wood Warbler have always been reliable and in good numbers. 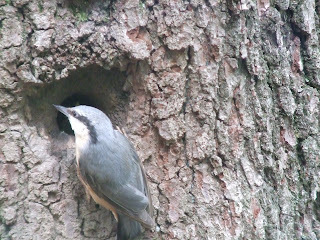 A good walk through the wood failed to turn up either species and I turned my attention to a nest hole I've known for a few years at the top of the wood which over the years has hosted Pied Fly,Redstart and in 2005 Nuthatch after some "glueing up" of the entrance hole. 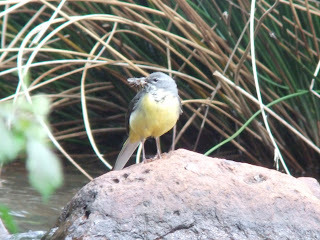 Further disappointment followed as the hole was unoccupied. 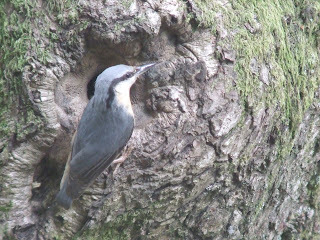 Feeling a little despondent I made my way down through the wood and halfway down heard young calling from a nest hole in an oak alongside one of the narrow paths. 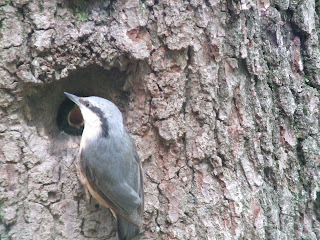 I stopped and waited for a parent bird to make a feeding visit and quite soon a Nuthatch made an appearance,as soon as the parent arrived one of the young showed a large open beak at the entrance hole to engulf a tasty meal,setting up the scope I managed a few half tidy photos. I watched the comings and goings for about half an hour and made my way further down the wood toward the main track,about 30 m from the new fence alongside the track I spotted another Nuthatch dive into a nesthole in another oak whilst at the same time 3 Redstarts caught my eye with 2 males chasing a lone female,they were close to the fence and on one occasion a male perched on top of one of the fence posts giving me my best ever scope views of the species. 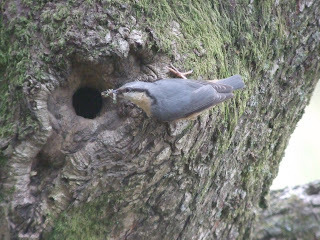 Unfortunately because of their excited state they were impossible to photograph and I turned my attention back to the pair of Nuthatches who were busy feeding their young and offered a better photo opportunity. 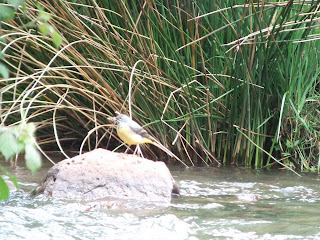 From my vantage point I picked out a pair of Grey Wagtails on the stream below me busily collecting food for their nearby young family and managed a couple of shots before they spotted me and flew around the bend in the stream to the ir nest. Although missing out on two of our more colourful summer migrants I was quite happy with my morning's birding and have a couple more nest holes to keep an eye on next year.